Do you buy International Edition books? Yes, we gladly accept International Edition books. All books must meet our condition guidelines. Please Note: If a book has an edition-specific ISBN and it is not in our catalog, then we are unable to purchase that edition, even if the Standard US Edition is in our catalog. If you enter an ISBN and no quote is provided, that ISBN is not in our catalog. 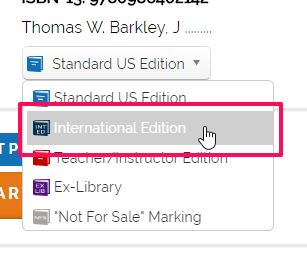 To quote one of these items, you must choose the "International Edition" option from the edition drop-down.